In this post we will take a look at the first of a series of books and articles that focus on what we might call “Weaponized Hypnosis”. Most people are familiar with the use of Hypnosis by stage magicians (making a subject crow like a rooster or other stunt), and the practical use by clinicians to help people with addictions and trauma. There is, however, a dark side to Hypnosis that probably goes back thousands of years. 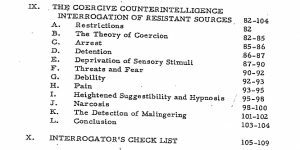 Most recently, we can study declassified intelligence documents that explain how the CIA (in this example) suggested the use of hypnosis in the interrogation of prisoners. That document is called “KUBARK Counterintelligence Interrogation Manual”. The copy I have is in book format by www.mindcontrolpublishing.com, date of publishing unknown. According to the books publisher, “KUBARK” is a cryptonym used by the CIA when internally referring to the agency. While the field manual was published in 1963, the PDF document states that declassification was 2-25-2014. 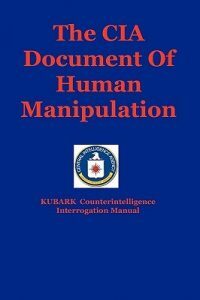 The manual deals mostly with the nature of counterintelligence, but for this post we will look at the use of hypnosis in interrogation, which begins around page 95 in the book. he would normally have serious moral or ethical objections. would have scant value for the interrogator. tool by a practitioner who is not a.
embarrassing publicity or legal charges. the subject to enter hypnosis.” And he also observes. would be given to cause a short period of unconsciousness. knowledge.) “It can readily be seen how this. . . maneuver. . .
his understanding of reality becomes subject to rnanipulation. and thus invert the whole frame of reference. In other words. interrogatee that there is no valid reason not to be forthcoming. . . it has been shown that the accuracy of such inforrnation. . .
align himself with his interrogators, the objection evaporates. interrogation techniques or aids: the post-hypnotic suggestion. anything about what has happened. may provide the answer to a problem not otherwise soluble. To repeat: hypnosis is not a do-it-yourself project. expert’s travel time and briefing. Take note that the manual suggests the use of a “silent’ drug, one that is possibly administered without the subject’s knowledge. It also describes inducing a hypnotic trance under the influence of the drug, with a post-hypnotic suggestion during the return to consciousness which would “shift his frame of reference so that his reason for resistance become reasons for cooperating”. Coming up; we will look at other books and articles detailing use of hypnosis in interrogation and assassination. This entry was posted on August 12, 2018 at 7:19 pm and is filed under Hidden History. You can follow any responses to this entry through the RSS 2.0 feed.